The Cliff Hart Agencies, a Michigan-based insurance firm with offices serving Ann Arbor, Detroit, and communities throughout the state, is initiating a state wide charity effort to provide support to the family of Logan Sweet, a six year old Michigan native struggling to overcome leukemia. 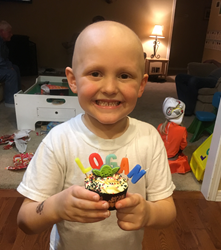 A series of tests performed after a recent illness revealed to the Sweet family that Logan was suffering from T-Cell Acute Lymphoblastic Leukemia (T-Cell ALL). After packing their bags and escorting their son to Motts Children’s Hospital in Ann Arbor, Logan’s parents, Ryan and Krystal, have stood by his side throughout the ordeal. However, financial burdens are now threatening to impair the Sweet family’s ability to remain together during this tragic time. “When someone in our community needs help, especially a child, it’s everyone’s responsibility to stand up, pitch in, and offer help,” says Cliff Hart, founder and director of Cliff Hart Agencies. Utilizing a state wide network of personal and professional contacts, Hart and his team are creating an online social media presence and launching a community email bulletin to share Logan’s story and rally support to his cause. The Cliff Hart team will also be featuring the Sweet family in a new issue of “Our Hometown,” a monthly Internet magazine produced by the firm: http://www.cliffhartagencies.com/Our-Hometown-Magazine_41. Logan and his family are only the latest recipients of support from Cliff Hart Agencies, as the firm continues on its stated mission of assisting a new Michigan-based charity or non-profit every other month. Those who want to join Cliff Hart and his team during the Logan Family charity event are encouraged to visit the firm’s website and make a donation to the effort from the following page: http://www.cliffhartagencies.com/Let’s-Help-Little-Logan-Fight-Against-Leukemia_18_community_cause. Those who want to follow the growing list of causes and charities supported by Cliff Hart Agencies can do so by bookmarking the firm’s Community Causes list here: http://www.cliffhartagencies.com/Let’s-Help-Little-Logan-Fight-Against-Leukemia_18_community_cause.